On my first scan, a 3700sq ft house, there were two areas I wanted to go in and scan, the porch and the garage. Because of the cold weather I decided against keeping those doors open from the beginning of the scan, so that I don't let too much cold air into the house for the 3+ hour duration of the process. Now I'm faced with two problems though. The scan geometry has kept both door open and closed geometry, and as a result, even if I see the door open scan by proximity, I can't go through it cause the mesh obviously exists for the door closed. So what can I do in this case? Do I go back tomorrow to re scan those areas? post the link to take a look. Copy your model, Delete the nearest closed door scans and reprocess. I had a similar problem last week. If you have enough open door scans it should work. I cannot figure out the range of influence of a scan, but 3 or 4 scans away seems to be it. I was thinking about it last night. If ANY of the scans sees a closed door clearly, it also creates a closed door geometry which stays there even if the closer scans have the door open. Software idea for future update! Mask areas of a scan to not create a geometry. That would be great. But for now it looks like I don't have enough overlapping scans to edit it. I'll have to re scan that whole area. You are on the money with that thinking, during the process if the stars align and everything is just right the geometry will close off the opening. You are also right once the geometry is in place it does not make any difference. You might try uploading it removing a few of the scans where you can see the door closed in the model. If you do this and catch which ones are causing the problem you will know which scans to focus on redoing. It might be corrected by just removing a few and rescanning. You are also right it would be nice to do one of two things, include one other tool forcing an opening in the mesh if we want it similar to the trim tool. Or allow use to use a tool aftermarket and go into the model and remove the mesh and re-upload the model. Neither available to us now. If you try let us know if it works. You might try using the trim tool on the door, use it creating a box around the door to see if it cuts the door out. It will take some work but if you build a trim square around the door with the trim marks facing the door and see if that works, it might force the software to make an opening. Just a thought. Here is an example you might try this first, using the trim command. this may force the software to make an opening. Now, if I could just get the heck out of the way during scans that would be great. 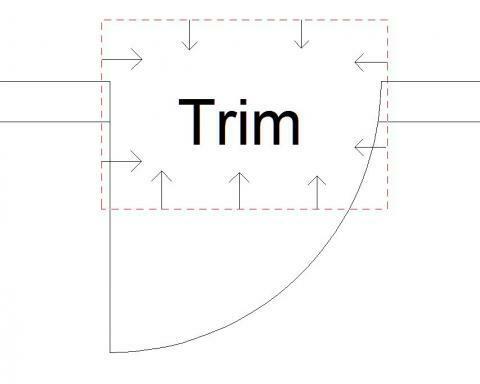 I took a look at the trim tool. I've noticed it is a single line that probably deletes everything from one side of it. I've never used it before so I'm not sure how far it deletes geometry away from that line. Am I missing something? I have never used it as I have showed in the diagram but if you attempt to use four lines just to in close just the door it might work, if you try it it wont cost you anything to process it again.